The boss of Britain's biggest supermarket has blamed the collapse of some retailers partly on the expense of business rates. 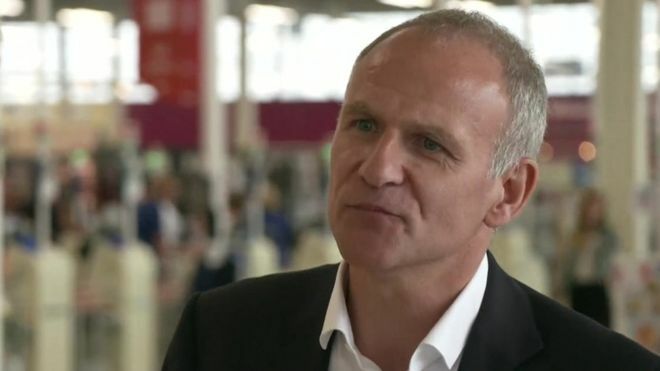 Dave Lewis, Tesco chief executive, said the charges that firms must pay on their buildings played a "large part" in sending some retailers to the wall. Last year a revamp of business rates saw some bills rise, while others fell. He questioned whether raising business rates was resulting in an "uneven playing field" for some firms. Retail is the UK's biggest private sector employer, Mr Lewis told the BBC. "Are we allowing it to stay competitive, or are we by stealth lowering corporation tax and increasing business rates to a place which is creating an uneven playing field and forcing people to think about how it is they avoid that cost and find other routes to the market?" he asked. The Tesco boss said business rates was the biggest tax his company paid, adding up to more than £700m a year. "You need a level playing field between an online digital world and a traditional retail store base model like the one we have," Mr Lewis said.